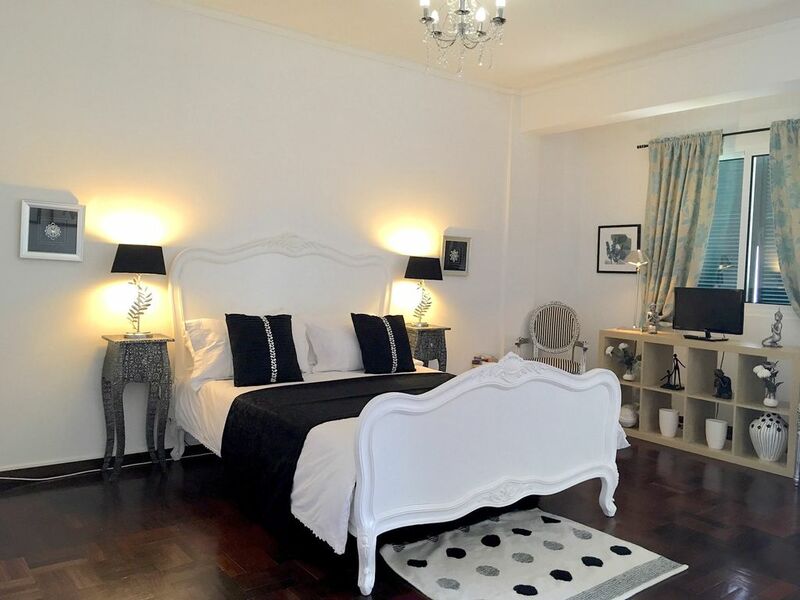 This family-owned apartment is situated in the heart of the Island’s capital Funchal, and within the fashionable Savoy hotel tourist district. A very spacious 3-bedroom apartment, it has been recently refurbished with both style and comfort in mind and caters for those who are looking for that special holiday combined with the privacy and freedom of a 'home abroad'. The apartment will comfortably sleep up to 6 people, with 2 bathrooms (1 en-suite), a large kitchen/diner, a reception hall and lounge, and balconies, the largest of which has a partial sea view. This light and airy 3rd floor apartment boasts 5 balconies which are all served by the sun at different times of the day throughout the year, ensuring that there is always a comfortable and cooling retreat from the year-round sunshine should it be needed. Full parquet flooring throughout and ventilated window shutters combine to maintain a comfortable temperature inside the apartment, even on the hottest days. Main bathroom - comprises of a bath, with connected shower fitting and curtain, sink, large mirror, wc and bidet. Large frosted window allows plenty of natural light. En-suite bathroom (bedroom 2) - equipped with a power shower room, sink, wc and bidet. A floor-to-ceiling window completes this bright, sunny living room. Contains 2x 3-seater settees, a coffee table & cupboards. Also included HiFi, Cable TV (range of European channels) & DVD player. DVDs and books provided for use during your stay. Traditional marble and tiled kitchen/diner. Ample space for entertaining. All modern appliances, including washing machine, dryer, microwave, kettle, gas hob and electric oven. All cutlery and utensils are provided. The dining table seats up to 8 people. Madeira boasts PGA standard Golf Courses. There are 2 Golf Courses both are within short journey times from Funchal. Santo da Serra Golf Course (27 holes Par 72 6,600yds) designed by Robert Trent Jones and is said to be one of the most spectacular courses in Europe. Features stunning mountain and sea views. The 27 holes can be played in three 18 hole combinations. Palheiro Golf Course (Par 72 6,616 yds) Designed by Cabell Robinson, this course follows the natural contours of valleys and hills. Being under 10km East of Funchal, this course has magnificent views of Funchal and the Atlantic Ocean. Notes on accommodation: The apartment is very spacious and is suitable for guests of all ages, including children. Outside: Apartmento Princessa Dona Amelia is situated amongst a large number of local amenities and places for entertainment and leisure. There is a small grocery store located across the road and a larger supermarket under 5 minutes walk away. The closest pool is at the Bright Star Hotel, which is right next to the apartment. Use of the hotel’s pool costs % Euros per person, sun loungers and access to its outside bar and refreshments facilities. The apartment has a large selection of highly recommended restaurants, cafes and bars all situated within a few minutes walk. The tourist information desk is located a minute away from the apartment, making it very convenient to gather details of the island, tours and activities. Cleaning / Towels / Linen / Maid service: All towels and bedlinen will be changed weekly as a standard service, however, a daily maid / house keeper service is available upon request and at a small additional cost, paid locally. Other: Apartment has 5 balconies, the main balcony has a superb view across the west of Funchal (including the famous Savoy and Reid’s hotels) and of course the glistening Atlantic Ocean. The apartment is very spacious, well furnished and equipped. It is located in a very convenient position near to shops and many good restaurants. It is only a pleasant 15 minute walk to the old town in Funchal. We enjoyed staying in this lovely and well equipped apartment. Sarah was very helpful and even left us a fob to enter and leave via the garage, although we didn't have a car with us, as I have a bit of a mobility problem. Would highly recommend this apartment to anyone. Thanks Sarah! The apartment is spacious, clean and conveniently located. However, there is a camera located directly inside the door to the apartment, which the owner uses to remotely monitor your movements. We had told her in advance that our family would be arriving first and then another family would be arriving a few days later. We gave precise information on the number of guests. However, Sarah accused us of having more guests in the apartment for more days than we had disclosed. She was wrong and later backed off, but it was VERY unpleasant for us to be wrongly accused of lying, by email, by someone we had never met. The other event that was a huge turnoff for us was that we offered to pay an additional amount we owed, in advance, through HomeAway, but Sarah declined and instead insisted that we pay her friend, in cash, at the airport as a condition to getting the key to the apartment. That added an element of stress upon our arrival at the airport that was most unwelcome. In none of our other rentals through HomeAway have we had such negative experiences. Together these interactions with the owner cast a pall over our otherwise wonderful stay in Madeira. We certainly would not rent this apartment in the future. We've just come back from a 5 day break in Funchal and we stayed in Sarah's lovely apartment. It's beautifully decorated and was spotlessly clean. There are 4 stunning bedrooms and 2 lovely bathrooms and there is everything you need. The kitchen is so well equipped you would be able to cook a big dinner for many people! There are many balconies although if you wanted to sunbathe you might struggle as the sun doesn't reach them all with the tall buildings around. I would definitely stay in Sarah's apartment if we went back to Funchal again. We used the taxi driver Sarah recommended and he was lovely, showing us a couple of towns on our way to the airport. He was £30 euros each way. The only negative is there is a barking dog which can be a little irritating but it didn't disturb our sleep so didn't bother us too much. Funchal is quite expensive, so eating at some of the little side streets works out to be much cheaper. It's also very hilly so your calf muscles will be put to the test! If you're thinking of staying in Funchal, this apartment won't let you down! Thankyou Sarah for your excellent communication and gorgeous apartment. Fantastic place. Bigger and quieter than you would expect. Very clean. This was a wonderful stay. We loved the apartment and Sarah was very helpful. The location is perfect for Funchal - literally, it is ideal location. ONE THING TO CONSIDER - the place does not have AC. That was zero problem in June for us. However, it can get warm in Madeira, so keep that in mind if you book during July and August. But if that is not an issue for you or if you are traveling during moderate temperature months, I highly recommend this place. The apartment is no more than 150 metres from the coast, next to the old port which is situated beside Funchal's Marina. There are two beaches close to the apartment, one to the East of Funchal near the Old Town (10 to 15 minutes walk) and the other to the west of Funchal past the Hotel District (under 10 minutes driving). Alternatively, you may visit the famous Lido which allows access to the sea for swimming in addition to the sea water pools (10 minutes walk). Madeira Airport is about 25 minutes drive from the apartment. Bus - Service runs every 15 minutes, drops passengers off outside the Casino Park Hotel. The bus service costs 5 euros each, to be paid on boarding (free for passengers using TAP airline). Alternatively, we can arrange to have a local taxi driver and friend Joao meet you at arrivals and bring you directly to the apartment doorstep for 25 euros and 25 euros for the return. Let us know in advance if this service is required. The apartment is in Funchal's hotel district (West Funchal). The city center is no greater than 5 minutes by walk. The historical 'Sé Cathedral' built in 1438, under 10 minutes walk. Fishing village of Camara De Lobos 5 km. The town of Monte (home of the famous toboggan ride) is under 15 minutes drive or shorter by cable car. The famous Botanical Gardens at Quinta do Bom Sucesso is 3 km from the apartment. The old town traditional market 'Mercado dos Lavradores' is 10 minutes walk. Other activities on the island include: Levada walks. Island tours. Big game fishing. Scuba diving and snorkeling. Sailing. Surfing. Paragliding. Cycling. Rock / mountain climbing. Horse riding, tennis and golf. Island cruises. Madeira wine tasting. Theatre. The botanical gardens and numerous other flower gardens. Santa Cruz aqua park. Helicopter and hot air balloon sightseeing slights. Whale and dolphin spotting trips. Famous monte toboggan rides and cable cars. Trips to Porto Santo.